The Bethesda South Entrance is a Montgomery County project to add a second, south entrance to the Bethesda metrorail station. This station currently has an entrance on its north end, at the intersection of Wisconsin Avenue and East-West Highway, but was built to accommodate a future south entrance. 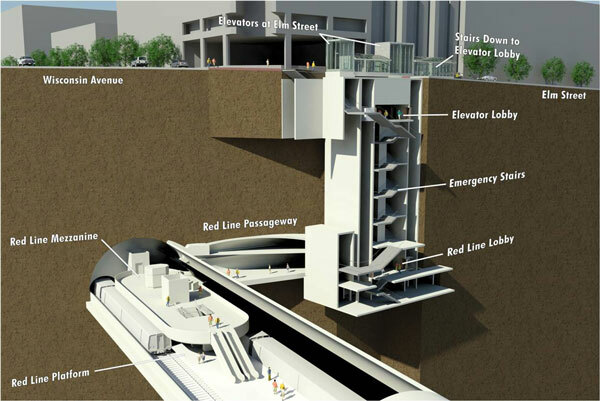 The new south entrance will be located on Elm Street, just west of Wisconsin Avenue, and will connect street level, the Bethesda Purple Line station, and the south end of the Red Line station platform with six elevators and a new Red Line mezzanine. Two elevators will connect street level to the Purple Line platform. Four elevators will connect the Purple Line level to the Red Line mezzanine. Escalators and an elevator will connect the Red Line mezzanine and platform. This is a Montgomery County project, funded by Montgomery County but under design by the Maryland Transit Administration.